I like the bleeding edge, but I don't like blood loss! Is the /EFI/Boot structure placed on the persistent partition? Because the first partition is an ISO9660 which is not writeable without rebuilding the ISO? Last edited by RustyLambda; 2015-11-04 at 03:58. I used windows to create my live usb install. Once you use win32 disk imager to make the thumb drive you can create the folder before you reboot. I used windows 7 diskpart to clean all of the data and partitions off the thumb drive. I then created the primary partition and sized to 4GB. I used win32 disk imager to write out the iso. I followed the above instructions to make it EFI bootable. I then EFI booted from the thumb drive. Once in Linux I created the second partition and formatted it ext4. Verified I had a 4GB partition on the drive. Then I used Win32 Disk Imager to image the fat32 partition. Once that was done, the 4GB partition was no longer accessible. I cannot access the files on that partition. Glad to see you here. If you run into problems you know where to come. Win32 Disk Imager did not work for me either. If you have access to a Linux box you can use the supported method of dd. If you don't you can use the UNSUPPORTED method of unetbootin. Just be sure to edit the syslinux.cfg like my other post says. I realize you are going to EFI boot the machine but fix syslinux.cfg just in case. Following to How To from Kali's doc, I couldn't obtain a FAT32 Partition. Under Windows you can use Rufus (http://rufus.akeo.ie/). Just let's the setting by default, select Create a bootable disk using : iso (select the kali's iso) and Start. It will format your USB disk and create one partition using all the space of your USB disk. You will have to resize the partition if you don't want to waste space and create a persistence partition. Then you can jump to the step 2 of bofh28's How To. BTW thanks to the How To ! It works perfectly with my MacBook Pro Retina. Last edited by _dGs_; 2013-03-29 at 05:18. I used rufus as well to set the bootable disk and was able to then use bofh28's directions. I did have to add the additional items from bootx64.efi download (i.e. grubx64.efi and MokManager.efi) in order for it to work. However, after I chose the EFI boot device from my Macbook Pro and used the default Kali (non persistent) choice in grub I get to the next screen and it hangs at "Secure boot not enabled". Is this an issue with the grub.cfg or did I miss a step somewhere? Sorry I don't have a Macbook to help. What am I suppose to do with bootx64.efi? Am I suppose to put it in the /EFI/Boot? Or do you place it in root directory? Also, I am able to boot from the USB when I go into my computers BIOS and switch to legacy boot. However, when I go to create my /boot partition I don't have the option to create an EFI boot partition. I only have the option to create a normal Linux boot partition. What are you using to create the partitions? If you are using the installer to create the partitions the problem might be you booted in BIOS mode. Try again in EFI mode. Also all you need is for the first primary partition be formatted fat32 for it work properly. If you want to get hypertechnical there is EFI system partition in the installer you can too. then on step 1 :select linux distribution "kali linux" step 2 : ur kali linux amd64.iso step 3 : select ur pendrive. u can tick the format: (ur pendrive letter), on step 4 u can set how many mb u want to use for presistence. let say kali linux amd64 use around 2.2 gb on u pendrive, then u have extra 1.8 gb space on ur 4 gb pendrive then u set it 1500mb on presistence (this is optional)... after all are complete click create.. then wait until its done.. after that u download bootx64.efi and grubx64.efi from ftp://mirrors.kernel.org/fedora/rele...4/os/EFI/BOOT/ . open ur pendrive thats u create before for kali linux then make this folder EFI, open it and create Boot folder, now inside the Boot folder that we cut and paste that two files we download before bootx64.efi and grubx64.efi. after that create a text file named grub.cfg in the /EFI/Boot/ , copy and paste the content from #1 post from bofh28.save it.. after all are done then reboot ur computer and press esc during boot... select ur uefi: usb kali linux.. congrats u r now booting kali linux on uefi mode.. u can select graphical installation...during installation u have this network problem.something about network interface firmware is missing. dont worry all u need is ethernet cable.. connect ur internet using ethernet cable to ur router. after all r done on partition follow like what op said create "At least 400MB primary partition and select EFI boot partition as the type. This MUST be the first partition you create on the drive". Setup the rest of the drive as you see fit" The installer will download and install the EFI enabled GRUB at the end of the installation. when first u restart u computer there will be windows 7 at the grub menu.. but the windows 7 on the grub menu u will not able to boot it up. it will state "invalid : EFI file path.. start ur kali linux..ok open computer, then select file system.. in the file system go to etc folder, inside etc folder look for grub.d folder. select the grub.d folder, open file 40_custom using leafpad copy this and paste it. Last edited by chucky42; 2013-04-04 at 14:53. This is not working for me (MSI GT60). I can boot in legacy mode (=bios) but Kali is buggy (looks like a window manager problem). When trying in UEFI with these instructions, first it told me "secure boot is not enabled" so I went to the bios setup (or whatever is its new name) to enable it. When I tried to boot Kali then, it told me that the kernel was not correctly signed. I'm not sure if I should build another iso with github instead of using the official one, especially since I'm not really fond of GNOME. Any advice ? Seriously, this secure boot thing is really getting on my nerves... Thanks, microsoft. Leave secure boot disabled in the bios. Enabling it will just cause you problems. I see secure boot is not enabled each time I boot into Kali it is normal. Try disabling secure boot again and post any messages you see or describe what you are doing and what see/not see in detail. Wow, you are fast, thank you ! When I leave secure boot disabled, I can see the GRUB boot screen with "kali - boot non persistent mode, Kali - boot persistent, Kali Failsafe, Kali forensics...". And nothing else. Any idea ? does NOT result in a readable FAT partition. So I tried the UNETBOOTIN method. However, there are some missing details. I have not fixed syslinux.cfg "like the other post says" because the data format is completely different. /boot/grub/grub.cfg is grub2 format, while /syslinux.cfg seems to be legacy grub (not sure about that). (without the conv=noerror,sync) to see if that results in a readable FAT partition, obviating the need to deal with the problems above. Make sure to replace --set=root and root=UUID= with the UUID for your system. The grub.cfg that comes didn't work for me so I made up the following. So I tried the UNETBOOTIN method. However, there are some missing details. I have not fixed syslinux.cfg "like the other post says" because the data format is completely different. /boot/grub/grub.cfg is grub2 format, while /syslinux.cfg seems to be legacy grub (not sure about that). OK. Is the fat32 partition the only partition on the drive? If not what is the partition layout? EFI files must reside on a fat32 partition and fat32 partitions are NOT case sensitive. Syslinux is its own bootloader. Syslinux does not use grub.cfg. If you used unetbootin to create the thumb and boot in BIOS mode then you are booting using syslinux and not grub. You can try the grub.cfg I just posted. Just don't don't ever run grub-update. Starting with grub2 the grub.cfg is actually generated by scripts. You can replace the script version with the one I posted but if you run grub-update it will be overwritten. My problem is on step 2). I'd tried both live usb install (win32 disk...and dd) but still can't mount it with write perms. I encounter the same issues, someone have find a solution different than the windows way ? I've found a solution. I partitioned in two my USB on FAT32, once for kali iso the other for EFI. And after dd kali iso i can set /EFI/Boot/* files in second partition. Notes: Macbook Pro late 2011 (8.1), Grub v1.99, KaliLinux i386. Last edited by Hlx; 2013-04-27 at 07:14.
d. And the final partition, labeled D: DATA, and also formatted as NTFS. There's 170GB on the Data partition, which is where I intend to divvy up some space for Kali to go. Where will the bootloader be installed to, the EFI partition or the C: OS partition, and how would I go about doing that? 2. Finally, will this approach pass the Secure Boot smell test? The laptop I'm using is an Asus X75VD, and the most recent BIOS update hid all of the EFI/Secure Boot options from me, so I am assuming that Secure Boot is permanently engaged? Right now I am booting Kali from an USB stick, but I would like to get away from that, because up until I got this laptop, I've always had Linux on my laptops in a dual-boot solution. It aggravates me that I can't do this with a lot of unnecessary drama. Setup the rest of the drive as you see fit"
I cannot find any option to partition a drive as EFI using the Kali Graphical install. Anyone succeeded in doing this? Same problem with Partition TYPE to EFI? I'm trying to install Kali to my macbook pro, but it seems to be hard to realize ! I've made a partiton in FAT32 and then I've been able to boot from Mac Os X by putting Fedora bootloader, but after loading the vmlinuz and the initrd it wouldn't boot ! I've installed the 32bits version, I'm now trying to install the 64bits version... I hope it will work ! 6- open the grub.cfg file with your favorite text editor > find the lines that say "linux /boot/vmlinuz-3.7..." and "initrd /boot/initrd.img-3.7..." > change the linux to linuxefi e initrd to initrdefi > the lines (there are 4 changes to make, 2 in each menuentry) should now look like "linuxefi /boot/vmlinuz-3.7..." and "initrdefi /boot/initrd.img-3.7..."
Debian Wheezy, I can install the system but it boots to a grub prompt rather than an OS-selection screen. The grub-pc package failed to install into /target/. And now I still cannot boot. what do I need to do to get grub to "see" debian/kali and Windows 7? For right now, I'm just trying to put debian/kali on my machine (without windows) and get it to boot, which is far more challenging than it should be. This is how it worked for me for a Dual-boot with a preinstalled EFI Windows 8 partition. 1) Created the USB image using unetbootin and manually adding the EFI/BOOT folder structure manually. No problem accessing the thumb drive with Win8. Inside the dir I copied the files from Steps 3 and 4 of the first post in this thread. 2) Reboot using the USB drive and select your favourite install mode. 3) During installation, I did not create an EFI partition because factory preinstalled Windows 8 already had it created. In the final steps grub2 was automatically instaled. 4) Login for first time. Update, upgrade and reboot (don't know if this last one is strictly neccesary). Worked like the charm for me. I am using a Toshiba Satellite L850-1XK. After screwing around with a grub rescue shell, I tried a re-install of Kali and both GRUB and LILO told me they "failed to install to /target/". However, I just rebooted the machine, LILO came up and performed some kind of data check on the BIOS, and it successfully booted up Kali. DONE! Now to see if I can dual boot this thing with Windows 7, I've never dual booted with LILO before. I want to carve out 80GB on the DATA partition , which is where I will install Kali Linux. Is it possible to do this just using the default options in the installer? I attempted to install Kali's predecessor Backtrack 5, and it totally borked my system. I am unable to make a backup, so I want to make sure I get this right the first time. Hello, good job for this topic, really useful. In my case, i'm off on the step 7... the last. I use an Asus G55VW and we have to set manually in BIOS the path for booting. Basically, we have 2 HD (sda and sdb) and the BIOS see only the EFI partition on sda (created by vendor/microsoft). After executing your topic, I have 2 choices (between the EFI partition on sda and sdb), however, my partition EFI on sdb is empty. I created /EFI/Boot/ and paste Bootx64.efi + grub.cfg and set the BIOS path on /EFI/Boot, /EFI/Boot/Bootx64.efi and finally /EFI/Boot/grub.cfg but nothing worked. I've managed to boot into Kali Linux off the USB Thumb Drive on a Retina Macbook Pro, but how do you install it to the hard drive? Lost and looking for advice. Built a kali KDE iso I know I need to boot from a fat32 partition to install but the max file size is 2GB & the filesystem.squashfs comes out to 2.5GB i'm trying to install on an XPS 13 with no DVD drive available any ideas how this can accomplished as far as setting up the partitions,booting and installing? EDIT: I managed to get around the graphics error above by adding radeon.modeset=0 to the kernel line, but I still have issues with the b43 driver, IPv6, and getting GNOME to start. Blacklisting/disabling b43 and IPv6 seems to be ok for now, but GNOME still leaves me with just a blinking cursor and a blank screen. If anyone has any ideas please let me know. Thanks! Last edited by nikdaquik; 2013-07-11 at 15:13.
please explain how to write and create the /EFI/Boot to a read only drive??? Hey guys I used Unetbootin to install kali because I could not use windisk32 imager and add the efi file. I added the efi file and tried to boot from the usb drive but I am getting an error that says it cannot boot from the device. I am using an hp m6-k015dx if that helps. Do I have to change the config file for this machine or my setup? FYI it's an x64 iso an efi file. Edit: I am able to get into Grub GNU version 2.00 with a black screen that displays grub> but I don;t know what to do from there. Last edited by Surgikill; 2013-08-12 at 15:57. Thank you guys for the information. I have successfully installed Kali onto my computer and now I have triple boot of Win8, Kali, and Ubuntu 12.04. But on kali I cannot get the brightness to work. Has anyone dealt with this problem yet? Thanks for the help guys been great. I have tried creating the usb with the LiLi usb creator and I can still not get it to work. I also have secure boot disabled. Great how to, thanks bohf28! I'm successfully dual-booted, but I had to download grubx64.efi from ftp://mirrors.kernel.org/fedora/rele...4/os/EFI/BOOT/ for my flash drive to be recognized as an UEFI device. I hope you, or somebody else who understands all of this is still around to help. This is a normal OS X installation, but I've put rEFInd on it. However other Mac computers seem to have the EFI partition too. So should I be making another one? Does it have to be in front of the regular OS X partition? Humm I've experienced similar problems. I'm also trying to install on a MacBook Air (Mid 2013) (6,1). We're a rare breed. Anyways, I started by trying to install BackTrack, then Kali, then BackBox. I got it booting from the HD, but wireless doesn't work, and I'd like to use Kali instead anyways. It's late so I'm off for now, but if you want look over what I did and see if it can help you out. I think a lot of this goes back to Ubuntu since that's what Kali is originally based off of (right?). I had the same issue while trying to install 32bit Kali on my laptop with a 64bit processor. 32bit EFI wasn't supported but it worked with the 64bit version of Kali. Okay, This is the forum that I used to figure this out. This will work with any EFI boot system. It's for Kali-ONLY installation. I managed to boot Kali off my MacBook Pro in only 21 easy steps. This is a very simple Step-by-Step instruction set. This is for a Kali-ONLY install on a MacBook Pro. Though it should work with any EFI system. If you want to dual boot with OSX/Windows, then be very careful when you are using gparted to edit the partitions!! Pay attention to the ****** !!! 1. Insert Kali DVD into Laptop and reboot. 2. Press Option/Alt when the laptop is booting (before you hear the chime) keep it pressed until you see the boot drive selection screen show up. 3. Select the DVD when it comes up. (the Label on mine said "Windows" because of the formatting.) The icon is a CD. 4. Select "Live Boot" which is the first selection when grub starts. 7. Click on the "Create a new Partition" to create a new partition. 9. Give your partition a name. I called mine EFI. 9. Make sure you adjust the size of the partition. I used 400MB, but that is more than enough. 10. Create the partition. You can click on the "check mark" icon. You should now just have 1 400MB partition that is on the drive. 11. Exit out of GParted. 13. You should now have an empty window. Right-click and create a new folder named EFI. Go into that folder and create a New Folder named Boot. 14. Copy all of the files (except for the Fonts folder) from here: ftp://mirrors.kernelhttps://forums.k...4/os/EFI/BOOT/ into the Boot folder. 15. Reboot your computer. Put the Kali DVD back in the drive when it spits it out. Hold down option/alt again when you are booting up. ***** You should now see 2 devices on the boot options screen. 1 Drive that says EFI Boot and the DVD that says "windows" If you don't then you messed something up in the above steps. 16. Boot into the Kali DVD. Select "Graphical Install" Go through your options until you get to the format disk section. Make sure you select "GUIDED - Use continous free space"
17. Put the DVD back in after it installs Kali and hold down option/alt. Boot from the DVD Again. 18. Go back to Live Boot. Take a look at your devices list. You should see 2 partitions, 1 FAT32 and 1 Kali. Mount the Kali partition and go to /boot/grub. Open the grub.cfg file and copy the contents. 19. Open the FAT32 partition and go to /EFI/Boot. Open the grub.cfg file and replace it with the contents you copied in the above step. 20. Edit the new file however you want (VI, nano, leafpad) find the lines that say: linux /boot/vmlinuz-3.7.... and add "efi" to the end of linux. Do the same for the lines that say initrd. ***** You should have edited 4 lines. They should now say "linuxefi /boot/vmlinuz-3.7...." and "initrdefi /boot/vmlinuz-3.7....." without the quotes. 21. Reboot. Remove the DVD. Hold Down option/alt and select EFI Boot as your boot drive. You should now boot into Kali. Hope this helps. Thanks to albert on the forums for the information! Few hours ago, I completed the Kali installation with Windows 8 Pre-installed in EUFI based system. 1. I used Rufus (http://rufus.akeo.ie/) to install Kali ISO in USB Memory Stick. 2. Follow the Steps from #2 to #4 typed by bofh28 in first post. 4. In EUFI Setup set Boot Mode = UEFI Boot. The name of this value can be some different in others laptops. 5. In EUFI Set USB as First Boot. Save Changes! 6. Restart your machine. It must appears the GNU GRUB version 2.00. 7. (Optional) If you don't have HD partition to Linux Installation, you can use GParted to create this partition. It's a software included with Kali Live. If so, you can choice the option "Kali - Boot Non Persistent Mode". When Kali Live is up, go to Gparted and create the partition targeted to Kali. Restart your PC. 8. Select "Install Graphic" in GNU GRUB Menu. 9. Follow the installation steps, but when you are in Disk Partition Step, you must be careful. Please, select "Manual Partition" option. Using "Guided - use the largest continuos free space", strangely doesn't recognize the UEFI partition. This option see it like fat32 and this is not good for us! 10. Once you finish the partition part, if all it was set up fine, the installation process doesn't ask about EUFI partition. Yes, the EUFI partition used by Pre-Installed Windows 8 can be used in Linux too. Now, If you PC doesn't have Windows and you only want to use Kali, you MUST create the UEFI partition. 11. 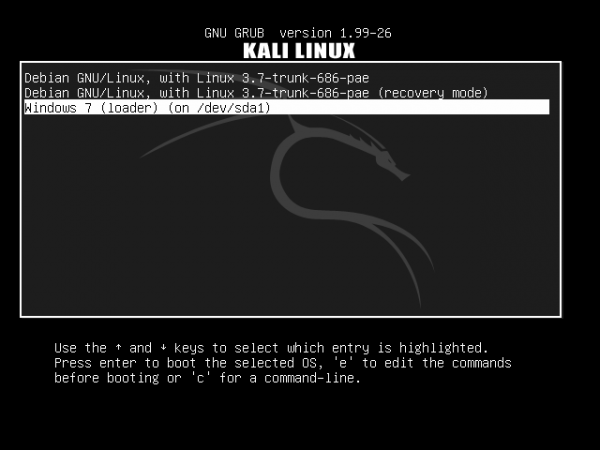 Continue the Kali Installation, it must download and install GRUB at the end of installation. 12. When finish the installation, remove the USB Memmory and Restart the machine. Note: If you have problem downloading the GRUB at the end of installation, check you Internet Connection. If the problem continue, connect your PC directly to ADSL o Cable Modem. Avoid Wireless Router or something like that.